Pro­fes­sion­al Scrum Mas­ter™ (PSM) is a 2-day course that cov­ers the prin­ci­ples and (empir­i­cal) process the­o­ry under­pin­ning the Scrum frame­work, and the role of the Scrum Mas­ter in it. This course is a com­bi­na­tion of instruc­tion and team-based exer­cis­es, and teach­es what is at the heart of the Scrum and Agile move­ment. The course also includes a free attempt at the glob­al­ly rec­og­nized Pro­fes­sion­al Scrum Mas­ter I cer­ti­fi­ca­tion exam (PSM I). 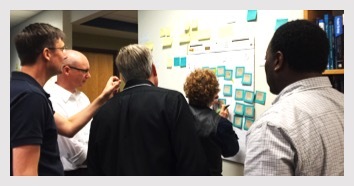 Over the 2 days, stu­dents will see why PSM is the cut­t­ing-edge course for effec­tive Scrum Mas­ters and for any­one coach­ing a soft­ware devel­op­ment team toward increased effi­cien­cy and effec­tive­ness. The course includes advanced think­ing for ser­­vant-lead­­er­­ship and behav­ioral shifts. Through­out the course, stu­dents are chal­lenged to think in terms of the Scrum prin­ci­ples to bet­ter under­stand what to do when return­ing to the work­place. The PSM course is much more than just a set of slides and an instruc­tor. In this course, stu­dents work on real-life cas­es with oth­er class­mates togeth­er as a team. This course is made up of dis­cus­sions and hands-on exer­cis­es based upon real-life cas­es. The Pro­fes­sion­al Scrum Mas­ter course is for any­one involved in soft­ware devel­op­ment using the Scrum frame­work. It is par­tic­u­lar­ly ben­e­fi­cial for those peo­ple with­in an orga­ni­za­tion account­able for get­ting the most out of Scrum, includ­ing Scrum Mas­ters, man­agers, and Scrum Team mem­bers. We also sug­gest that you read through the PSM Sub­ject Areas. 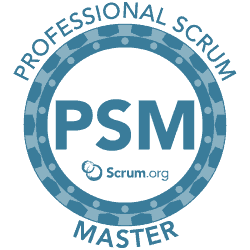 All par­tic­i­pants com­plet­ing the Pro­fes­sion­al Scrum Mas­ter course will receive a pass­word to attempt the Pro­fes­sion­al Scrum Mas­ter I (PSM I) assess­ment. If you attempt the PSM I assess­ment with­in 14 days and do not score at least 85%, you will be grant­ed a 2nd attempt at no addi­tion­al cost. You are also enti­tled to a 40% dis­count on the PSM II assess­ment once pass­ing PSM I. The indus­try-rec­og­nized PSM cer­ti­fi­ca­tions require a min­i­mum pass­ing score. Stu­dents of Scrum.org cours­es are able to claim Project Man­age­ment Insti­tute (PMI) PDU cred­it: 14 PDUs after attend­ing a two-day Pro­fes­sion­al Scrum Mas­ter (PSM). Please note that PMI PDUs are earned for course atten­dance and not for pass­ing a Scrum.org assess­ment. Stu­dents can claim PDUs under PMI’s “Edu­ca­tion cours­es pro­vid­ed by oth­er third par­ty providers” cat­e­go­ry. You can claim your PDUs online at https://ccrs.pmi.org. Registrations are closed for this event. Please contact us to check if there are available seats.